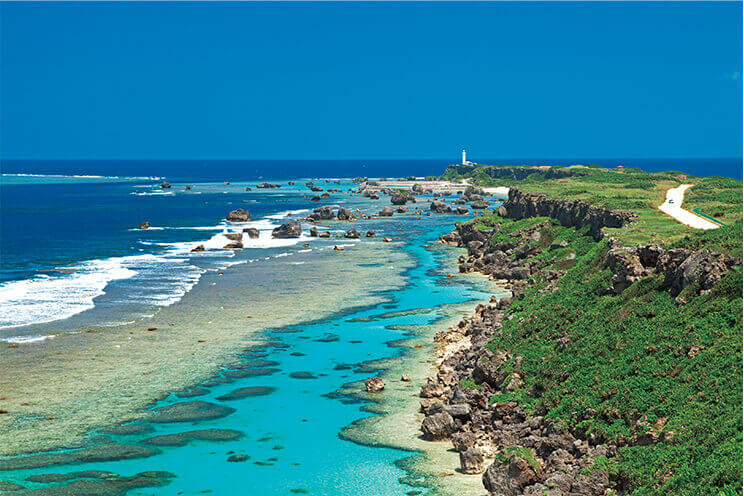 Approximately 300km to the southwest of the main island of Okinawa is Miyako Island, the largest of the Miyako Islands. 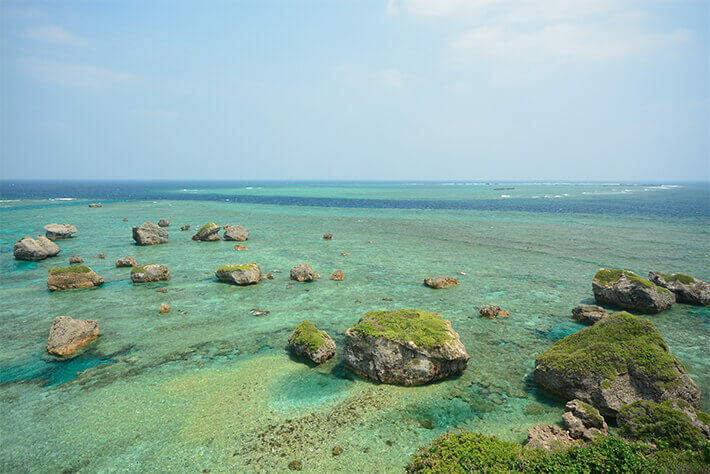 Miyako Island is a relatively flat island made of elevated coral reef. There are no rivers on the island, and due to the fact that the soil does not flow out into the sea, it is well known for having numerous beaches of exceptional beauty. 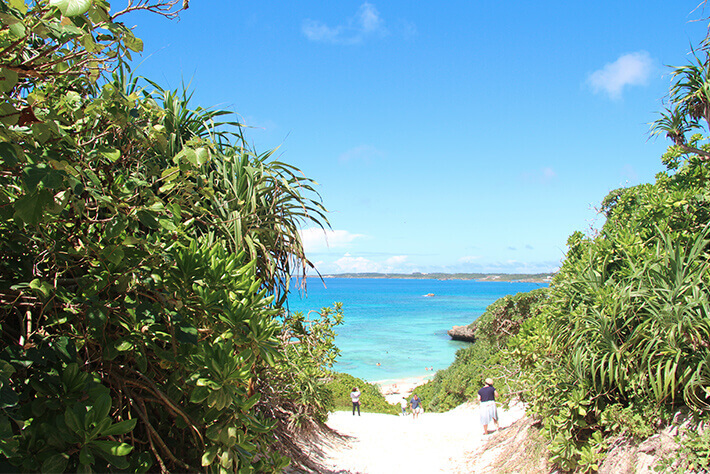 Several beaches on Miyako Island rank among the top for domestic beaches according to rankings compiled by travel media. In addition, there is a wide range of gourmet dining options, from mangos, which are popular all over Japan, to the esteemed Miyako beef, sometimes referred to as the phantom beef. Yonaha Maehama Beach consistently ranks among the top for domestic beaches according to rankings compiled by the travel website TripAdvisor. 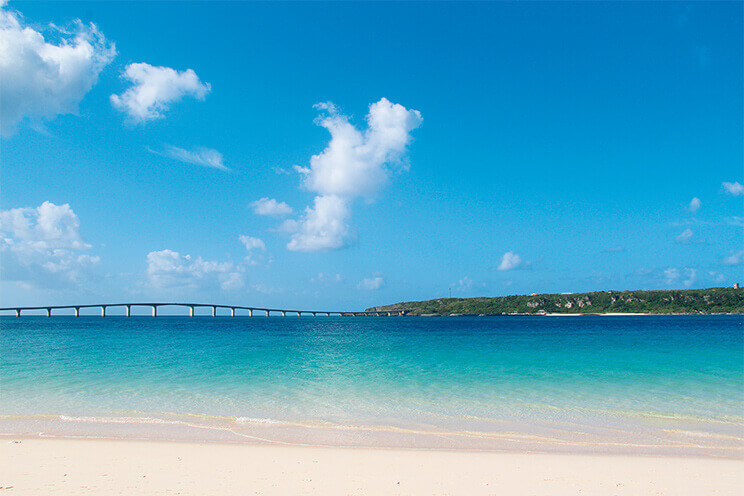 From the white sandy beach on the shore to the water that transitions from emerald green to navy blue in a vivid gradience towards Kurima Island, it is truly exquisite and is said to be the most beautiful beach in the Far East. 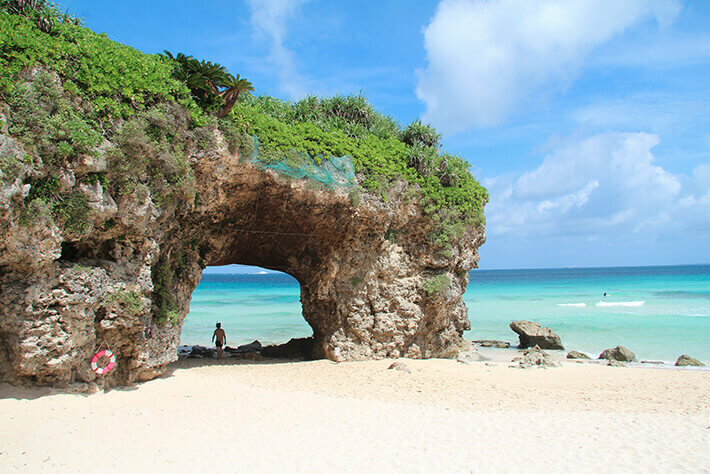 It is also among the longest of the beaches on Miyako Island with extensive marine leisure activities, from riding jet skis and banana boats to parasailing. Cape Higashi-Hennazaki protrudes into the sea in a way that seemingly divides the Pacific Ocean to the south and East China Sea to the north over a distance of 2 km with its dynamic landscape, and has also been designated as a national site of scenic beauty. It is also known as Cape Agari-Hennazaki. “Agari” is written as “east” in Japanese and pronounced as “agari” in Okinawan. Because it is located where strong winds blow at all times, trees do not grow too tall, and the community of plants distinctive of such windswept conditions comprising the cape is designated by the prefecture as a natural treasure. The view from the front end of the lighthouse is absolutely spectacular. 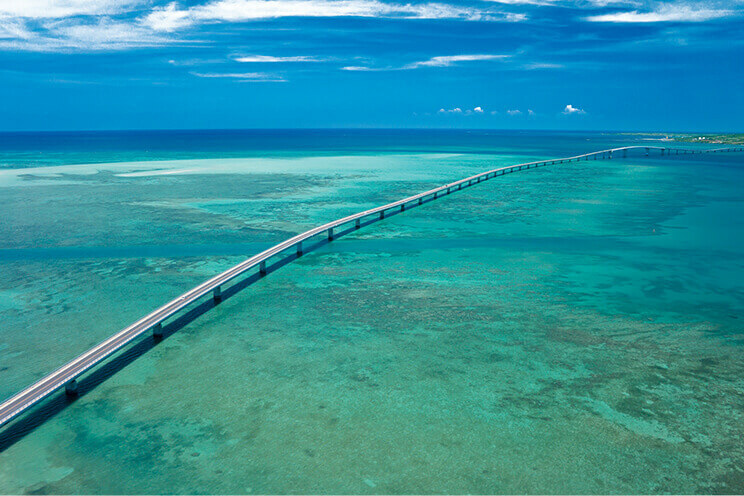 There are three bridges connecting Miyako Island to other islands. 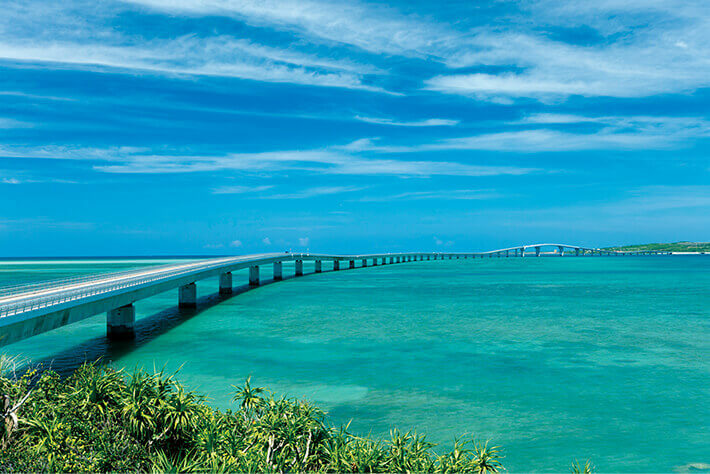 Irabu Bridge is the longest toll-free bridge in Japan. Ikema Bridge connects to Ikema Island with Cape Nishi-Hennazaki to the left and Ogami Island to the right. Pass by Yonaha Maehama Beach to cross Kurima Bridge. While it goes without saying that the view from the bridge as you cross over the sea is amazing, it should also be noted that the view offers various scenes depending on the tide, as well as the angle of the sun. Not only can you easily get to and from any of the five islands, you can also enjoy an array of superb views. Airplane: Naha airport > Miyako airport (approx. 50 mins). Tokyo and Osaka (takes approx. 2 hours and 50 mins). Haneda > Miyako – approx. 2 hours and 50 mins. Osaka > Miyako – approx. 2 hours 40 mins. Size / Population: 159.26km² / Approx. population of 47,700.